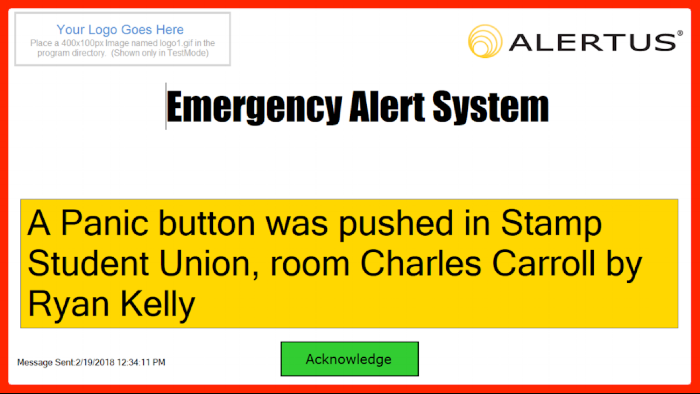 Alertus’ Preset Alert Variables are used with automated events, such as weather alerts, data feeds, and panic buttons to include event-specific information in the alert without any input from the dispatcher. 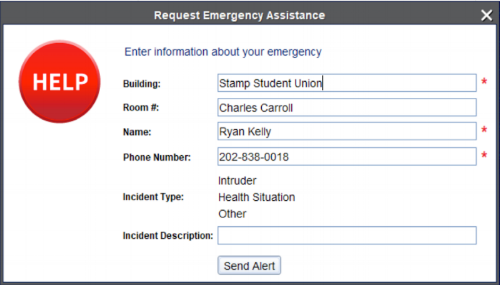 For example, variables can be used when someone triggers a desktop panic button from their office and a dispatcher wants to pull the person’s name and location from the incident submission into the alert text. Another possible use is for an integrated NOAA weather alert. Instead of displaying the entire body of the NOAA alert, which can be very lengthy, you can configure your notification to just display the alert headline and date. Step 1: To see what information is available for Preset Alert Variables, go into your Alertus Console and navigate to your previously sent alerts. From here you can click into your Event Dashboard and click on any past event. 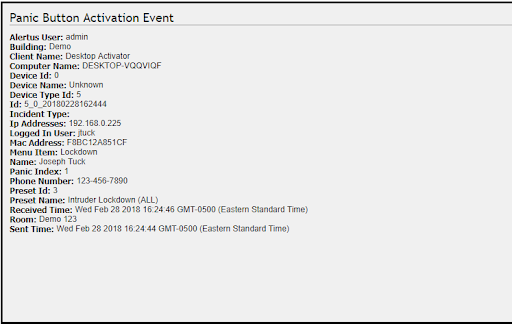 The screenshot example shown is using a panic button activation event. Every item you see in bold is a potential variable that can be used to provide valuable information. For our example, we’ll use "Building," "Room," and "Name." Step 2: Navigating away from the Event Dashboard, click into your Preset Alerts and then select “Manage Preset Alerts,” assuming for this example that you already have a panic button alert configured. Click on the “Edit” button for your chosen Preset Alert. Once in the editing function, you will see a button marked “Preset Variables.” This will bring up a drop-down menu of options to enter into the Preset Alert Description Field. As mentioned before, I’ll be calling out the end user’s name and location for my Preset Alert Variables. Step 3: Type out your desired notification for the Preset Alert Variables you have chosen, as shown below. Make sure you hit Save! Step 4: When someone initiates an alert from their Desktop Panic Form (shown on the left) and sends the alert, the alert that displays on your desktop (or whatever preferred endpoint you have chosen for notifications), will display the exact information you configured. In this example, you will recall I chose the Preset Alert Variables for Building, Room, and Name. For more information on how to set up Preset Alert Variables or how to manage your Alertus console, please feel free to take advantage of our thorough support portal or contact me at saditham@alertus.com for extra assistance!